These levels are designed for outdoor residential pools chlorinating with bleach or a SWG, and will need adjustments when used in other situations. Liquid chlorine is the same as bleach, and cal-hypo users can also use the bleach recommendations as long as you monitor your CH level. 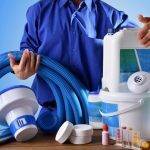 There are some instances such as having an indoor pool, high TA or high CH fill water, lots of direct sunlight, fresh plaster, or having pH increasing rapidly you should expect to need some adjustments to these recommendations. For advice on what would be ideal for your pool please ask on the forum.